If you have been following Bullfighters Only, you’ve likely noticed a young man named Justin Josey. 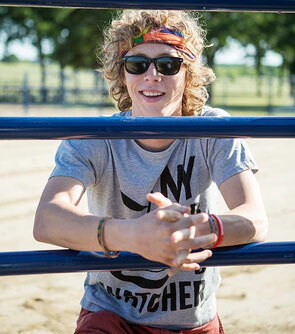 The tie-dye clad, 21 year old is hard to miss thanks to his colorful outfit, long blonde hair and the spectacular athleticism he brings to the bullfighting arena. The self proclaimed “city kid” who never even witnessed a rodeo until he was 16, is quickly becoming a BFO fan favorite. BFO: Awesome job at the Session this past weekend. What did you think of the whole deal? JJ: It was unreal just to be able to be a part of it. Being injured at the first Session and then showing out at this one was amazing. Yesterday I was talking with Joey Austin (owner of Hooey Brands) and I got goose bumps just thinking back on it. I never even envisioned myself to be a bullfighter so all of this is pretty crazy. BFO: Speaking of that injury, did you feel like you needed to make a statement at this Session since you were sidelined at the first one? JJ: It was the most important weekend of my career. I needed to prove that I deserve to be there with the best bullfighters in the world. I’ve had some bad luck with draws and injuries lately but I feel like the Session was a real turning point. BFO: With BFO’s recent explosion in popularity, how does it feel to be a key part of all the mayhem? JJ: We're just doing something that we love to do and because of BFO we are getting recognition for it. Everyone who was part of the Session deserved to be there and we were all out to prove that we're the top guys in the world. Not just anyone can step into situations like the Sessions and shine. BFO: Your style of dress is totally different from the rest of the field. What’s up with the tye-die, dude? JJ: I’ve always enjoyed being different, ever since I was a kid growing up in Elgin, Oklahoma. Watching the Wrangler Bullfights I really liked how Skipper Voss dressed. Plus, I’ve just always really liked the 70’s style anyways. Hopefully I can appeal to a whole different audience. BFO: Skipper Voss and the entire cast of the old tour paved the way for today’s bullfighters, no doubt. Do you think the sport has evolved much since then? JJ: The sport has changed so much and it’s growing so fast. We are always one upping each other and taking things to the next level, just like other action sports. (Cody) Greer’s backflip, for example, is huge for our sport. It’s been passed down from (Andy) Burelle, to (Dusty) Tuckness, now to Greer and he has perfected it. That trick makes people realize that we are not just idiots running around out there. This is a real sport with real talent. BFO: Tons of real talent. The bulls were a lot different back in the day as well, more “cross-breds” right? JJ: Right, but like I said, the game has changed so much. The sport can’t advance with a bunch of big, treacherous bulls because then bullfighters have to just try to stay alive. If the bulls are good then we can try some tricks and show out rather than just run in circles. I’m not saying they have to be totally fresh, just not so smart that you can’t even jump them. There are still bullfights where you can watch the best guys run for their lives and that does nothing for our sport. Bullfighters Only made stop number eleven of their 2016 Tour at Rimrock arena in Billings, Montana Friday night along with the PBR Built Ford Tough Series. Cody Greer of Chelsea, Oklahoma collected his first career BFO win with an 87 point performance against #142 “Greeley Gold” from Kevin Rich’s Wild West Cattle. Greer’s success came about with a cool, calm and collected demeanor. “For the first time in my career I walked into the arena with a clear mind. I’m usually nervous but this time I felt really prepared,” Greer said. As per usual, he kicked off the bullfight with his signature back flip then followed the maneuver with a jaw-dropping barrage of ankle busting fakes and back-fakes. Greer has no doubts that it was one of the best fights of his career, but he knows this accomplishment wouldn’t be reality without such a great bull from Wild West Cattle. “Greeley Gold is the kind of bull you hope to draw because he runs at you full speed and always turns back for more.” Greer said. Second place went to Evan Allard of Vinita, Oklahoma with and 84 point fight against #1102 Magic Mike. It was obvious that Allard was in for a tough matchup early, when #1102 cut the corner on him and tossed the 6’2” Okie skyward. But then Allard did something that no one expected. Re-gaining the bulls attention, he dropped to his knees and slapped the dirt beside him, causing the confused animal to slide past. Allard then rose to his feet, along with 14,000 delighted fans. A true pioneer in the game, Allard frequently mentors up and coming athletes at his bullfighting school. Fellow competitor Cody Greer was one of those students. “The dynamic is different between Cody and I because we’re best friends… but don’t get me wrong, I still wanna beat him,” Allard said. Zach Flatt returned from a nagging ankle injury sustained at BFO Las Vegas. He took third place with an 82 point bullfight against Wild West Cattle’s #20 “Grave Robber”. 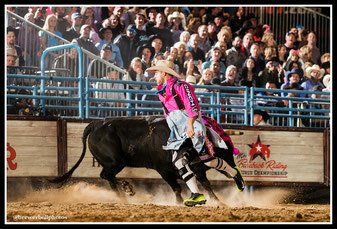 Little Rock, Arkansas witnessed a spectacular Bullfighters Only performance Saturday night. 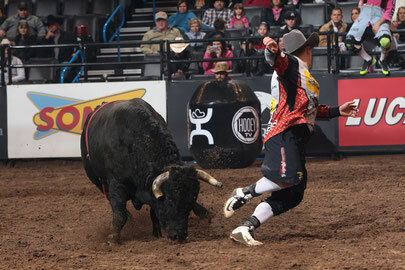 Three of the BFO’s most skilled bullfighters matched up against some of Evan Allard’s top bulls at the Verizon Arena. Oklahoma bullfighter Chuck Swisher scored a whopping 89.5 points against Hookin’ A Ranch bull “The Spaniard”. Not intimidated by the bull’s resumé, Swisher showcased the master fence work that he is becoming so well known for. The two battled along the fence as the crowd watched in amazement. The scuffle resulted in the bull making a lap around the arena with a Stanley Tools sign on his horns, no doubt adding momentum to the stunt. 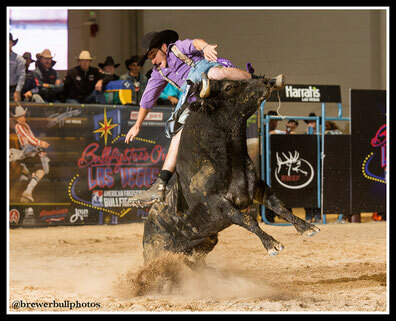 Second place went to Dusty Tuckness, of Wyoming with an 86.5 point bullfight. He matched up with a veteran bull of Hookin’ A Ranch named Emerson Biggins. “Biggins is an older smarter bull who’s hard to get around because he doesn’t break to you early,” Tuckness said. At Bullfighters Only competitions, the bulls are typically “chute run”. This way, the athletes do not know their dance partner until the fight begins. “I like the surprise of meeting my bull for the first time when the gates open because I don’t waste my energy with worry. I figure out how I’m gonna battle it out when I see him,” Swisher said. Swisher highlights the brotherhood amongst bullfighters and the respect he has for Dusty Tuckness and Nathan Harp whom he competed against that weekend. Harp finished in third place with a score of 82 points. “In the arena, they are both so talented. It was cool to get to travel with each other because we all look up to and push one another to be better… Not just in the arena but in life,” Swisher said. Bullfighters Only teams up with the PBR Built Ford Tough Series once again in Billings, Montana this weekend. Zach Flatt makes his return from injury to face fellow Okie’s: Evan Allard and Cody Greer. Watching Ross "The Selfie King" Hill in his element against a bull known as "Head Doctor," one of the fastest bulls in the BFO, makes it is clear why this bullfighting veteran of 15 years continues to be an innovator in the game. Ross took the competition by the horns with an impressive 88 points and added $3,000 to his tally for the 2016 season for a total of $9,000 on three bulls. Hill now sits second in the BFO World Standings behind Nate Jestes. Always keeping a positive outlook on the most challenging of situations, Hill learned to turn a torn ACL in his left leg into an asset. 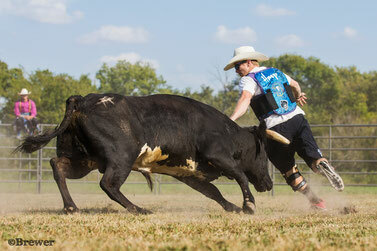 By performing a back step with his right leg where he is able to maneuver in a comfortable position, Hill is still able to get around his bulls. Nate Jestes from Douglas, Wyo., came in at second place with 87 points and won $1,500. He has been freestyle bullfighting for four years and worked with bulls for a total of eight years. Jestes knew his performance needed to wow the judges while keeping a consistency to his fight. “I jumped the bull right out of the gate, got over him, then counteracted the bull and for a solid 20 seconds had the bull fighting me," Jestes said. "I knew the bull was getting weak so I just kept putting pressure on him to get him to fight with me until my 40 seconds were up"
Not being one to mimic the style of his competitors, Jestes knows what works for him and isn’t afraid to deliver a skillful performance. “Going to freestyle events I stick to my usual stuff some other bullfighters that go out there try new moves but I stick to what I know and what works for me,” he said. 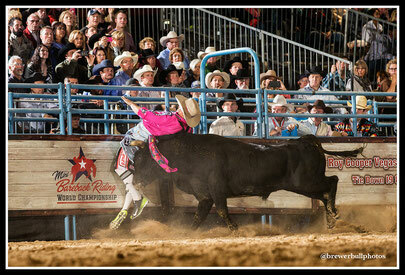 Justin Josey from Apache, Okla., finished with 78 points. Josey planned to stun the crowd with a blindfolded routine that was unsuccessful. At the end of the night he was given a refight and came up short with two bulls that were not in his playing cards. The bull selection for these events is equivalent to that of bull riding competitions. The animals are hand selected for Bullfighters Only events, each one carefully studied on his past performances to determine which other bulls he will match up best with. Depending on how the bulls are loaded in the chutes indicates the distribution of bulls to bullfighters. Fighting bulls is all about the aggression and getting the bull to engage in the arena for 40 seconds. If the bull starts getting distracted, running around the arena, the bullfighter will lose points. 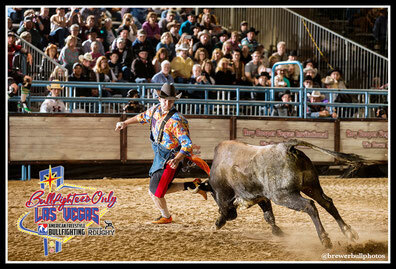 The Bullfighters Only tour’s next stop is in Little Rock, Ark., at the Verizon Arena on April 9. Nate Jestes isn’t the most-flashy freestyle bullfighter. He’s not the guy who is likely to try and pull off any fancy Superman leaps or backflips over the top of a fighting bull. And Jestes readily admits he doesn’t expose himself quite as much as some of the other freestyle bullfighters. However, if Jestes is anything, he’s consistent and, more importantly, the 28-year-old has a great ground game with solid fundamentals. He said he won’t rely on one trick to try and earn a win. Instead his style is based on control. His consistency has paid off—literally. In 2016, Jestes won the Oklahoma City event and again in Arlington, Texas, at The American. In the process he pocketed $13,000 and is the early-season leader atop the Bullfighters Only world standings. This weekend, in Duluth, Georgia, Jestes is focused on winning his third consecutive BFO event, which would certainly make him the frontrunner to win this year’s inaugural BFO title. Not too shabby for a guy who not so long ago considered giving up freestyle bullfighting to focus his career solely on cowboy protection. “To see where Bullfighters Only has come is pretty outstanding to be part of it,” said Jestes, who understands that even at BFO events it won’t always be an even set of bulls. That said, a freestyle bullfighter’s job is to handle their bull regardless of what they’ve drawn. Some are hotter than others and, according to Jestes, bullfighters can’t always rely on using the same style of fighting for different bulls. Instead they have to be able to adapt and adjust to each bull. It’s about keeping the bull engaged. That’s precisely how Jestes won The American. He recognized early on his bull wasn’t as strong as he had been in past outs. Jestes slowed down with him and kept him from leaving his side by making a few rounds. He’d make rounds and step-through, but always made sure to keep the bull’s attention. To win, Jestes said he can never give up the fight. “For me, I feel like I can put pressure on that bull and get a few more points out of him and it might get me a win,” Jestes said. Jestes came into 2016 with several major rodeos scheduled on the books and contemplated whether or not he would do much freestyle work. He’s getting married in May and his fiancé, Bridget Addleman, is an elementary school teacher, so she’s unable to travel with him for a month at a time. He said she’s been fine with him traveling. This week, he was finally home for five days after being gone all of February into March, but is spending the weekend in Georgia at a BFO event. Jestes and Addleman understand being gone is part of his career. However, it also helps that in a matter of two minutes of work he’s won $13,000. “This time of the year – winter and spring – it’s tough,” said Jestes, describing a life lived on the road. “You want to go back, but just having her support and she wants me to live my dream and be successful, it makes it a lot easier to be able to come and go. Well into the third month of the inaugural BFO season, Jestes is the top-ranked freestyle bullfighter in the world. He credits that success to what he’s learned being around fellow bullfighters like Cody Webster, Dusty Tuckness and Chuck Swisher. In late 2011, he contemplated giving up freestyle, Jestes flew to Oklahoma to spend time with the trio. At the time, Jestes didn’t feel like his skills were where they needed to be. Simply put, he wasn’t winning. After a few weeks in Oklahoma, he made his way to the National Western Stock Show and Rodeo, in Denver, and promptly won their freestyle bullfighting competition. Four years later, he’s at the top of his game and coupled with the BFO growing, it could not be a more-perfect time for Jestes. “I don’t head game too much,” said Jestes, who noted the added pressure of BFO events being held in conjunction with the PBR in large arenas that are televised on CBS Sports Network. “Of course those nerves are there, but I’ve learned how to control them. Freestyle bullfighting is 90 percent mental. The guy who comes in with the best mind is sometimes who is going to win. Not many people would have the courage to turn their back on a Mexican fighting bull. Ross Hill isn’t like anyone else. Last weekend, the veteran freestyle bullfighter walked into the arena and before calling for his bull, pulled out a cellphone, switched on the selfie-mode and without looking over his shoulder he watched as a raging bull ran out of the chute baring down on him at full speed. To make sure the bull zeroed in on him, Hill bounced up and down. Unfortunately, that’s when he lost track of the bull in his phone. 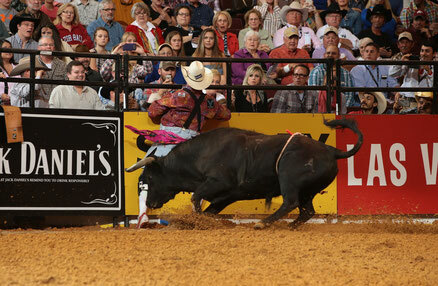 Hill’s round-winning performance, in Fort Worth, Texas, earned him an opportunity to compete at another Bullfighters Only event at The American. He’ll be at AT&T Stadium, in nearby Arlington, on Sunday. The Muscle Shoals, Alabama, native never even thought of the idea himself until minutes before it was his turn to compete. Hill, 33, didn’t grow up in what he calls “the age of selfies, Snapchat and Instagram” or constant social media updates and Facebook posts. That was the second consecutive time Hill has impressed his fellow BFO bullfighters and other observers. He was equally impressive at the first BFO event this past December, in Las Vegas, which earned him an opportunity to compete on the BFO Major Tour. “He absolutely stole the show ,” said BFO CEO Aaron Ferguson, after watching Hill last weekend. After years of injuries, Hill suffered from pain and discomfort. Until the past two BFO events, it had been a humbling run of luck for Hill the past few years. However, the text messages, voicemails and Facebook comments he received, after this past weekend’s stunt, have made him feel good about himself. But he isn’t about to commit to trying the selfie move for a second time in two weeks. You’re never too old nor are you ever too tough to play rock-paper-scissors. Dusty Tuckness just wrapped up his eighth consecutive year of protecting bull riders at the annual Fort Worth Stock Show and Rodeo. Along with Nathan Harp and Evan Allard, the trio worked 34 performances over 23 days and they ended each round by calling for a Mexican fighting bull. Having worked an event in Odessa, Texas, prior to Fort Worth, the veteran bullfighter has tangled with 40 fighting bulls since the first of the year. Unlike the Bullfighters Only events, which are competitive, a fighting bull is turned out at the end of each rodeo performance as a sort of encore and an opportunity for the bullfighters, who have provided cowboy protection, to show off their own athleticism and skills. That said, Tuckness was happy to get home Sunday in time to kick his feet up and enjoy watching the Super Bowl. He spent three days resting his sore body – “I’ve kind of been taking some licks and kicks” – and is back to the gym for some training sessions before making his way to St. Louis, Missouri, on Thursday. “Normally, when I get back home for three or four days, it doesn’t take long and I’m ready to get back at it,” said Tuckness, who will make his BFO debut Friday night at the Scottrade Center. Tuckness, Evan Allard and Logan Blasdell will compete in the third event of the inaugural BFO season Friday night during the intermission of this week’s Built Ford Tough Series event. The competition can be seen in real time on PBR Live and will also air during the PBR broadcast on CBS Sports Network, Febuary 14th at 8PM ET. Tuckness got his pro card in 2006, six years after the last Wrangler Bullfight took place in Las Vegas during the Wrangler National Finals Rodeo and, of course, the BFO was another 10 years in the making. During that time, Tuckness has established himself as one of the top bullfighters providing cowboy protection at pro rodeos. Over the years, Tuckness has been matching up with a Mexican fighting bull after most rodeo performances in an exhibition of freestyle bullfighting and also competing at various one-off events in Oklahoma, California and everywhere in between. The PBR had previously showcased freestyle bullfighting in 2004, 2005 and 2006. Tuckness competed in the final year. In addition to months of BFO’s legwork and organization, Tuckness noted the current era of young freestyle bullfighters are handy when it comes to working bulls and, perhaps, as a collective group more athletic than any era of freestyle bullfighters. With the emergence of the BFO on a large scale coupled with television exposure, the fan base – longtime traditionalists and casual newcomers alike – could be witnessing the golden era of the sport. 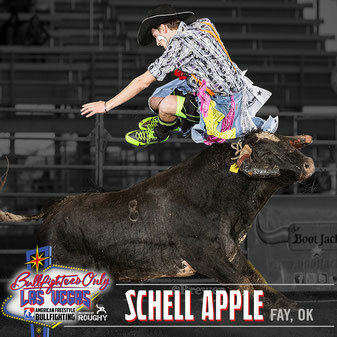 He cited Schell Apple, who attended Cody Webster’s bullfighting school two years ago and recently brought the crowd to its feet with his superman jump in Anaheim, California. At 29, Tuckness is a seasoned veteran. The Meeteese, Wyoming, native said he doesn’t focus on beating other bullfighters, so much as he’s focused on beating his bull and letting the judges score the individual performances. Two months ago Bullfighters Only was a social media campaign. With the promise of exciting events in the near future, the BFO built a following of tens of thousands of action sports and western sports fans from coast to coast. In December, founder and CEO Aaron Ferguson produced and promoted its first event in Las Vegas and, in January, worked out a deal with the PBR to host the inaugural BFO season at Built Ford Tough Series events. Soon after the BFO made its television debut on CBS Sports Network. This weekend, the BFO goes global. In addition to hosting their first event in Canada, Fernando Gomez Carpizo begins his three-month long trip to the United States. Gomez, 36, is a recortadores from Spain. Recortadores are known for jumping bulls. Ferguson and fellow bullfighters Cody Webster and Chuck Swisher spent Gomez’ first week stateside hosting him in San Antonio, Texas, where Webster and Swisher are working a month-long rodeo. Webster admitted him and Swisher “don’t know a lick” of Spanish, and Gomez, who is transitioning from being a recortadore to freestyle bullfighting, doesn’t speak any English, so they utilized the Google translate app to talk back-and-forth with one another. According to Webster, having spent seven hours in the gym with Gomez on Wednesday and again on Thursday eased the burden of communication. “It was rough for the first little bit,” said Webster, who also used Google to find Powerhouse Gymnastics, an Olympic-style training center that opened their doors to the three bullfighters. While Webster and Swisher worked with Gomez, Daryl Thiessen returned to Canada in preparation for this weekend’s BFO event in Red Deer, Alberta. Even though the popularity of freestyle bullfighting waned in America, there had been numerous standalone events prior to the BFO, whereas the sport has been virtually nonexistent in Canada. For many Canadians attending this weekend’s event, which is nearly sold out, it will be the first time they’ve watched freestyle bullfighting in person. Thiessen’s introduction came, while providing cowboy protection at bull riding events in the U.S.
Gomez will also be competing at an open event in Kingsville, Texas. In preparation for this weekend, Webster and Swisher helped Gomez with his ground game. However, he’s yet to work an actual fighting bull until the competition. Two points of interest are the fact that, in Spain, recortadores only make one round and fighting bulls are only used one time and then never used at a bullfight again. However, like his American counterparts, Gomez is a prideful man. He doesn’t want to let Ferguson, Webster or Swisher down. He also doesn’t want to let his fellow Spaniards down back home, who see the BFO as a viable career option. “He’s got a lot of pressure on him,” Webster said, of Gomez’ debut. Thiessen also has a lot of pressure this weekend. Thiessen is the featured bullfighter in Red Deer. He’s the only one of the four bullfighters – Houston Gleeson, Kris Buffalo and Scott Waye are also competing – to have fought at a BFO event in the U.S. The Elm Creek, Manitoba native competed last December in BFO Las Vegas. However, a win in Red Deer would put Thiessen in the Top 5 of the BFO money earners. But his focus is on a bigger picture. The two international BFO events are 2,400 miles apart. Unfortunately, Webster and Swisher won’t be with Gomez in Kingsville. “We tried to prepare him as much as we could for the short amount of time that we had,” said Webster, who looks forward to working with Gomez again. He and Swisher are in San Antonio until next Saturday. Webster will compete at The American on Sunday, Feb. 28 and then begin a 20-day stint down in Houston before returning home to Oklahoma. In addition to having Gomez, who taught them how to complete a full backflip summersault and stick the landing, stay with him at his place in Oklahoma, Webster said he hopes to one day travel to Spain. “It’s been fun,” Webster said. “It’s been quite the experience. Over the past few months Cody Casto has watched the sport of freestyle bullfighting reemerge on the national stage. He had some of his fighting bulls in Las Vegas when Bullfighters Only held its first event in conjunction with last December’s annual Wrangler National Finals Rodeo and then watched the first two BFO events of its inaugural 2016 season on television. It’s been exciting for the Louisiana-based stock contractor to see the success, but he’s ready to haul his bulls to this coming weekend’s event in St. Louis, Missouri. With fellow contractor Evan Allard competing in the freestyle event as a bullfighter, Casto will haul four of his best fighting bulls 10 hours north. The third event of the BFO season will take place Friday night during the PBR Built Ford Tough Series event at the Scottrade Center in downtown St. Louis. Casto, 36, and his twin brother Cory first got involved in bullfighting in 1994 when they attended a bullfighting school taught by fellow twins Ronnie and Donnie Sparks. That same year, Casto said he wanted to one day own his own ranch and raise Mexican fighting bulls like his bullfighting hero the late Rex Dunn. It took him 10 years, but in 2004 he bought a place of his own in Covington, Louisiana, and, more importantly, bought his first fighting bull. He recalled “gathering cows and buying more bulls” until he finally retired from bullfighting in 2010. His brother Cory was tragically killed, last May, in an automobile accident. Right now he estimates he has 50 bulls and 30 head of cows with about 25 calves on the ground and more to come. In early May, he plans on buying another 20 bulls. Until now there’s never been anything formed like Bullfighters Only. Like other contractors, he’s hauled his bulls to one-off events with the hope and dream that something like the BFO would eventually come along. Until now, others have talked about the possibility. However, Ferguson was the first to run with it and make it a reality. 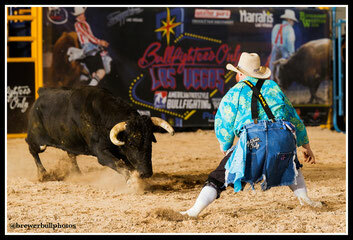 Since this past December in Vegas, BFO has paid out nearly $50,000 in prize money to their freestyle bullfighters. Casto also credits previous eras. He said without the hard work of those who promoted and spearheaded the sport of freestyle bullfighting in the 1980s and 90s and those who kept it going when it could have faded (most notably Rex Dunn), the BFO wouldn’t have the opportunity it does now. However, the time is now. Casto believes it’s the right time and the right freestyle bullfighters have come along with a single vision of understanding just how popular the sport of freestyle bullfighting can be, and how to go about accomplishing their unified dream. Organizing their resources – rank fighting bulls and athletic bullfighting skills with a smart business plan – will give fans a sport they can follow from one week to the next. As much as means to be on a big stage like the Built Ford Tough Series, the exposure of having a highlight package broadcast on CBS Sports Network has proved priceless. TV is a key to growing the BFO. “The biggest contribution I can make is to keep bringing hot bulls,” said Casto, who is well aware this weekend’s BFO event will solidify his HH brand as one of the top contractors of fighting bulls the same way names like Chad Berger, Jeff Robinson and Dillon and H.D. Page have become synonymous with bucking bulls. NASHVILLE, Tenn., Jan. 27, 2016 – As part of its mission to showcase the world’s best rodeo athletes, RFD-TV’s The American, presented by Polaris Ranger, will feature the greatest freestyle bullfighters in the world during its televised $2 million event in Arlington, Texas, on Feb. 28. Select stars from the new Bullfighters Only tour will perform for judges and fans during “the richest weekend in Western sports” – the PBR’s Iron Cowboy and RFD-TV’s The American, Feb. 27-28 at AT&T Stadium in Arlington, Texas. The BFO roster of competitors this season currently includes two-time PBR World Finals Bullfighter Cody Webster and five-time PRCA Bullfighter of the Year Dusty Tuckness. During a competitive fight, the bullfighter has 60 seconds in which to impress judges with maneuvering style, control and level of difficulty. Meanwhile, the bull can earn up to 50 points for speed, aggression and intensity. The top fighters in the standings at season’s end will qualify for the Bullfighters Only World Championship during the PBR World Finals in Las Vegas, Oct. 29 through Nov. 6, 2016. “We are so excited to bring freestyle bullfighting back to rodeo fans, and to compete at the richest one-day rodeo in the world means that much more for our fans and our athletes,” said Aaron Ferguson, founder of Bullfighters Only. 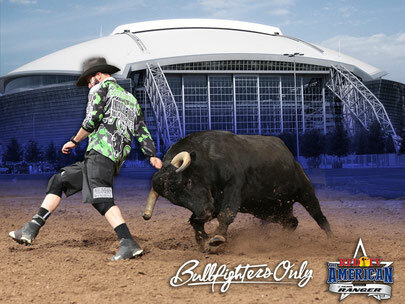 For more information or to buy tickets to the PBR Iron Cowboy or RFD-TV’s The American in Dallas, visit americanrodeo.com or call 800-745-3000. Founded in 2015, Bullfighters Only is a platform created to revolutionize the sport of American Bullfighting. Originally launched as a one stop shop for all things bullfighting, BFO’s rapid growth has allowed the organization to expand quickly into other avenues. Bullfighters Only is carrying serious momentum into 2016 and will sanction dozens of freestyle bullfighting events through the inaugural BFO Tour. Bullfighters Only will crown their first World Champion in Las Vegas at the conclusion of the 2016 season. Taking place at the Dallas Cowboys’ AT&T Stadium on Feb. 28, 2016, RFD-TV’s The American is the richest single-day event in the history of rodeo. With $2.5 million on the line, the best athletes in the world will gather in Dallas to battle for the biggest single paycheck of their lives. The American invites the top 10 athletes from the 2015 PRCA, WPRA and PBR world standings and pits them against underdogs who advance from the American Semi-Finals, held Feb. 17-21 in Fort Worth. If a nationally ranked athlete wins, the prize is $100,000, but if a qualifier from the Semi-Finals – or an athlete who earned an exemption – winsTHE AMERICAN, that contestant shares in a $1 million bonus pool. For more information, please visit: www.americanrodeo.com and www.RFDTV.com. Follow us on Twitter @RFDTVAMERICAN and find us on Facebook: www.facebook.com/RFDTVTheAMERICAN. RFD-TV is the flagship network for RMG. Launched in December 2000, RFD-TV is the nation’s first 24-hour television network featuring programming focused on the agribusiness, equine and the rural lifestyle, along with traditional country music and entertainment. Top RFD-TV programming includes Market Day Report, Rural Evening News, Rural America Live, Western Sports Weekly, top rodeo events such as , and award-winning musical entertainment such as The Marty Stuart Show, Reno’s Old Time Music, The Molly B Polka Party, and Larry’s Country Diner. After watching his best friends and fellow freestyle bullfighters compete in Las Vegas and again last week in Oklahoma City, Cody Webster will finally get a chance to nod his head and call for a bull at a Bullfighters Only event. Webster, who is filling in for the injured Frank Newsom at the PBR event, in Anaheim, California, will also take his first turn at the second event of the inaugural BFO season. Webster worked last month’s Wrangler National Finals Rodeo, so he was unable to compete in either of the Las Vegas events. Instead he helped run the shotgun chute and work bulls in the back pens along with whatever else was needed to be done during the Roughy Cup and the Las Vegas Bullfighters Only Championship. Last week, he was working a PBR event in Yakima, Washington, and watched the BFO event on flight out west from his home in Oklahoma. “I paid the extra money, so I could have the onboard WIFI,” Webster said. “Man, I tuned into the live stream and watched it. Webster said the opportunity to compete Friday night at the Honda Center during the intermission of the Built Ford Tough Series is another opportunity for the BFO to attain its ultimate goal. It’s been awhile since he’s been in a freestyle competition, but he’s certain he has as good a chance of winning as either Schell Apple or Erick Schwindt. While it’ll be uncommon for a PBR bullfighter to protect cowboys and compete in the BFO event, Webster said it’s commonplace at pro rodeos where a lot of the bullfighters work 12 to 15 outs during the bull riding and then follow up by freestyle bullfighting to close out that night’s rodeo performance. 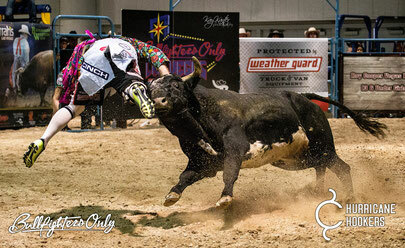 Last week, the BFO and the PBR jointly announced they have joined forces to feature the most-talented freestyle bullfighters in the world during BFO competitions at stops along the Built Ford Tough Series. The schedule includes nine PBR stops during the first half of the season and more will be announced during the summer. According to a PBR press release, in addition to live event competitions, the action also will air during the PBR broadcasts on CBS Sports Network each week. In the coming weeks, BFO events will also be held in Fort Worth, Texas, as well as this year’s The American. More BFO events held in conjunction with pro rodeos and other lower-level BFO events will be announced in the coming weeks. The season-long competition will culminate in the Bullfighters Only Championship during PBR World Finals Week in Las Vegas. In the meantime, Webster is focused on competing Friday night. “It just means a lot,” Webster said. “Did I really necessarily have to or need to get in the bullfight this week, working the event too? Really probably not, but that’s how much I believe in it. If Las Vegas was the introduction of Bullfighters Only then last weekend’s event in Oklahoma City represents the promise of a future for the sport of freestyle bullfighting. Weston Rutkowski and Nathan Jestes split the win at Chesapeake Energy Arena in the first of a season-long number of events that will be held at various Built Ford Tough Series events in conjunction with the PBR. Chuck Swisher, who won the first Las Vegas Bullfighters Only Championship last month, in Las Vegas, was also in Oklahoma. Jestes and Rutkowski split the win with matching 84 point scores, which was featured on CBS Sports Network's PBR broadcast along with Swisher’s 82-point effort. The BFO’s inaugural 2016 tour continues this coming weekend, in Anaheim, California, at the Honda Center. Friday’s competition, which will be held during the intermission of the PBR event, will feature a pair of Oklahoma-based freestyle bullfighters – Cody Webster and Schell Apple – and Oregon native Erick Schwindt. While there have long since been standalone bullfighting events – mainly hosted west of the Mississippi River – 2016 is the first time for all three that in the month of January they can look at the year ahead and know there’s a BFO tour to compete at. For many of the top freestyle bullfighters, they rely on their rodeo work in cowboy protection, but the emergence of the BFO provides a freestyle fighter like Rutkowski with the possibility of focusing his career on freestyle competitions as well as protecting bull riders. He said he plans to compete as often as he’s afforded the opportunity. Much like the 20 PBR cofounders, today’s era of freestyle bullfighters are excited to create a sport that fans from coast to coast or, quite frankly, from anywhere in the world are able to follow the action and the results from one BFO event to another. Jestes said the vision of the BFO is to grow it to a point their events are as popular as the elite PBR tour that features the Top 35 riders, which he described as the biggest stage in western sports. By organizing an entire BFO season, traditional fans and casual observers alike are not only able to follow the results, but also get to know the freestyle bullfighters and their personalities. “There are no words for me to describe it,” said Rutkowski, of the excitement being generated as the hard work and planning becomes a reality. Jestes said it’s still early and that every freestyle bullfighter has to do their part in making the BFO successful. PUEBLO, Colo. – Bullfighters Only (BFO) and the PBR (Professional Bull Riders) have joined forces to feature the most-talented freestyle bullfighters in the world during BFO competitions at stops along the PBR’s 2016 Built Ford Tough Series. In addition to live event competitions, the action also will air during the PBR broadcasts on CBS Sports Network (CBS SN) each week. The season-long competition will culminate in the Bullfighters Only Championship during PBR World Finals Week in Las Vegas. The first competition will take place at the PBR’s Express Employment Professionals Invitational in Oklahoma City at the Chesapeake Energy Arena. Three bullfighters will take to the arena during intermission on Friday, Jan. 22, to showcase their fast–paced sport which is based on the fundamental skills required to protect bull riders. Competing in Oklahoma City will be Nate Jestes (Douglas, Wyoming),Chuck Swisher (Dover, Oklahoma) and Weston Rutkowski (Haskell, Texas). The competition will air during the Sunday, Jan. 24 CBS SN broadcast of Round 3 and the Built Ford Tough Championship of the Express Employment Professionals Invitational. Additional stops will be added during the second half of the Built Ford Tough Series. Stay tuned to PBR.com for schedule updates. At least one round of BFO competition will take place at each BFTS stop. During each round, the bullfighter has 60 seconds to acquire points for exhibiting his own unique style and flair, control and difficulty maneuvering around and jumping over the bull, as well as his ability to keep the bull engaged. 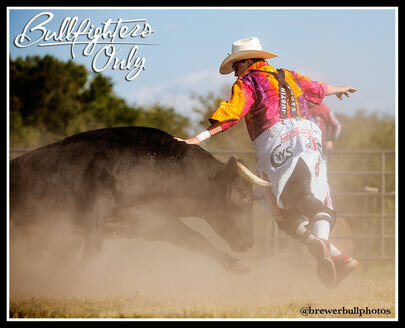 The bullfighters have the option to end the fight at any time after 40 seconds. The bulls also can earn up to 50 points for their speed, aggression, intensity and how long they interact with the bullfighter. The bullfighter with the most points will be presented with a $3,000 check as the winner. Money earned at BFO events determines the sport’s standings as the bullfighters are striving to qualify for the Bullfighters Only World Championship, which will take place during PBR World Finals Week in Las Vegas on Oct. 29-Nov. 6. Currently, 12 bullfighters will compete on the tour in 2016, along with six alternates. 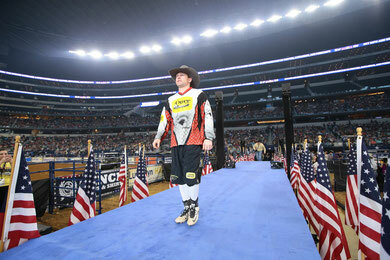 Among those 12 is Dickies Cody Webster, two-time PBR World Finals Bullfighter. BFO’s mission is to grow the sport of bullfighting. By highlighting the skills required by the sport’s athletes, BFO hopes to be the platform upon which the sport of bullfighting grows and to give young bullfighters the opportunity to excel based strictly on their skills in the arena. When Chuck Swisher led his final bull of the Bullfighters Only Las Vegas Championship right to the fence, no one expected to see what happened next. The Oklahoma bullfighter virtually cut his playing field in half and with only 180 degrees available he pulled himself in tight and let the fighting bull make several passes back and forth to the delight of those in attendance at the Las Vegas Convention Center and others watching live online. Those familiar with freestyle bullfighting knew they were witnessing history. A viral video clip of his 91.5-point performance has been shared by thousands and viewed more 200,000 times in the two weeks since. Legendary bullfighter Rowdy Barry, who was judging the BFO event with Miles Hare, said he had never seen anyone stay along the fence for that sustained period of time. “That’s what I told Chuck,” Barry added, “30 years of fighting bulls and 15 of it was freestyle and, no, I’d never seen anything like that. I’ve seen some pretty awesome stuff, but that was something new. That’s Bullfighters Only—they’re adding some new styles and flare." The old school way of freestyle bullfighting was to make rounds out in the middle of the arena and accumulate points by faking their bulls and stepping-through. Barry likens what he saw in Las Vegas to a more European style of bullfighting. Fellow bullfighter Cody Webster, who along with Dusty Tuckness will add even more talent to the pool of talented freestyle bullfighters in the coming BFO season, agreed with Barry. “It kind of reminded me of a true matador just caping a bull and making him just barely miss his body,” said Webster, who was one of three bullfighters working the Wrangler National Finals Rodeo. BFO will announce the first part of its 2016 schedule in the coming weeks. However, in the meantime, everyone still seems to be enamored with Swisher’s performance. He’s been working to the fence for some time now. However, he typically lets the bull make two or three passes then moves out away from the fence. In Vegas, he stayed for eight passes before doing some barrel work and then a jump to close out his one-minute performance. Barry’s description of Swisher’s outing was to call it an act of courage. “Anytime you’re fighting a bull like that and you start getting four passes, four rounds going the same direction or same pattern, they tend to get pretty smart to it, so it’s pretty ballsy to keep going on with it” said Barry. Barry said he was impressed by the tight predicament Swisher put himself in by not stepping away. Barry and Hare rewarded Swisher with additional points based on the added element of danger and the fact that the margin for error got tighter with each pass. Webster described the performance as poetry in motion. Back in the days of the Wrangler Bullfights, which were held in Las Vegas from 1985 to 2000, the late Greg Rumohr famously battled a Bennie Beutler fighting bull named Spotted Demon. Like Swisher, Rumohr was up against the fence and made a brilliant move to escape devastation. That moment is ingrained into the minds of the many BFO bullfighters who study film of Rumohr. However, that was two decades ago and long before the days of social media and websites like YouTube, where Swisher’s performance now lives in infamy. His 91.5 points was the highest mark of the week. Schell Apple followed Swisher with a perfect and equally rare superman jump and still the fence work seems to stand out. “It goes to show how cool of a fight Chuck had,” Webster added. 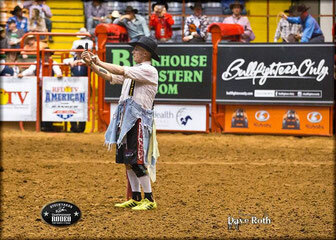 After spending two weeks in Las Vegas and fighting three bulls in the past three days, Chuck Swisher won the first Bullfighters Only Las Vegas Championship with a thrilling 91.5 point effort in the final round of competition Saturday morning. Swisher claimed $10,000 and a “priceless” one-of-a-kind trophy belt with hand-tooled leather and Jensen silverwork. However, moments later, in his post-event interview with in-arena announcer Matt West, Swisher clenched his prizes and never once talked about himself. Instead he started by thanking God. The Oklahoma native earned the title largely for his fancy foot work along the fence line. As Swisher led his bull from the center of the arena over to the fence, West proclaimed, “10,000 reasons to take the fight to these animals” and within seconds everyone was on their feet as Swisher faked his bull and made several passes back-and-forth. Swisher, 25, said he’s gotten in a bind his fair share of the time – by going to the fence like that – but has finally “mastered a way to work it” to his advantage. For those watching live in South Hall of the Las Vegas Convention Center as well as at home on the Internet, the announcers took time to explain that freestyle bullfighting is a 360 degree game and by putting himself against the fence, Swisher was limiting his own mobility while cutting the bull’s target zone in half. It was a risky move to say the least. In fact, Swisher said he knows firsthand it’s the worst place in the arena to get hooked by fighting bull. The judges also rewarded him with the highest mark of the event. Coincidentally, back in 1981, Miles Hare won the first of the Wrangler Bullfights held in Las Vegas. The last of those bullfights took place in 2000 and this year’s BFO event is the first return of freestyle bullfighting held in conjunction with Cowboy Christmas during the Wrangler National Finals Rodeo. “I heard them all hollering, so I tried to sauce it up for them and give them a good show,” said Swisher, of the encouragement from fellow freestyle bullfighters past and present. The comradery of what Swisher called his “family” was palpable throughout the two weeks. Saturday morning, Swisher beat out Zach Flatt and Tanner Zarnetski in the second section to advance to the final round of three bullfighters. Swisher, who was among the Top 12 invitees to this year’s BFO event, advanced to the final day only 48 hours earlier with an 86-point effort to beat out Logan Blasdell. In the Championship Round, Nate Jestes led off the final three bullfights to determine the Champion. Jestes, a Wyoming native, never let himself get in a hurry, took his time, maintained control and sold his performance with a barrel hop after the first buzzer for 86 points. Swisher, who was among the three WNFR bullfighters providing cowboy protection at the WNFR last year, then followed Jestes. Swisher’s big time score led newcomer Schell Apple to attempt and execute a flawless superman jump. Apple, 20, was the youngest bullfighter competing and by the looks of his opening trick, he’s one of the most athletic bullfighters among an era that established itself as some of the best athletes to ever lace up their cleats and face off with a fighting bull. For most of them, this was the longest and most grueling freestyle event of their careers. As with any professional sport, any one of the professional freestyle bullfighters competing in Las Vegas the past two weeks can win on any given day. And that’s precisely what happened this week. There were 16 bullfighters – the Top 12 as selected by the BFO and four qualifiers – competing in the four-day Bullfighters Only Las Vegas Championship presented by Roughy and nine of them have advanced to Saturday morning’s final day. Among those nine are three of the four qualifiers. Thiessen certainly isn’t the only bullfighter feeling confident in himself. The tournament was specifically designed to give the qualifiers – there were originally 12, who competed for four spots last week – an opportunity to literally fight their way to the inaugural title. In what he called a “humbling” turn of events, Weston Rutkowski was injured Wednesday morning and missed an opportunity to advance to the final rounds of competition. After winning last week’s 12-man Roughy Cup, Rutkowski was heavily favored this week. “You win some you lose some,” he wrote in a Facebook post. Coincidentally it was Thiessen who advanced instead of Rutkowski. The two are friends in addition to competitors and have been rooming the past two weeks with Nate Jestes. Wacey Munsell, Ross Hill, Cody Emerson, Erick Schwindt and Logan Blasdell were the other Top 12 bullfighters who failed to advance beyond Friday morning’s Pendleton Whisky wildcard round, which was won by Evan Allard. Allard has been pulling double-duty the past two weeks. 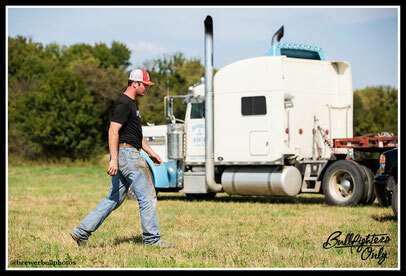 He also serves as livestock director for BFO events. In any case, the success of Thiessen, Lippincott and Zarnetski is the primary example of the depth of talent and athleticism of today’s era of American freestyle bullfighting. Thiessen was nearly selected among the Top 12. However, he missed two key standalone freestyle events – Spanish Fork, Utah, and Ardmore, Oklahoma – after being injured. 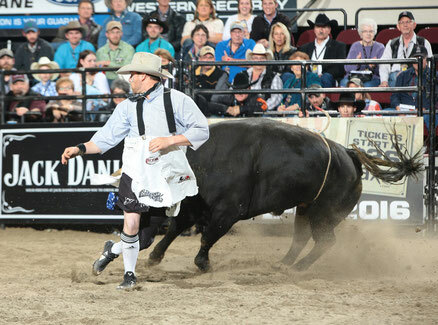 Thiessen had a blood infection after having a bull run its horn into his right leg just above the ankle, while providing cowboy protection at a rodeo in Canada. According to Thiessen, his injury is 100 percent healed. In addition to staying healthy, which is almost a misnomer in this game, success is a matter staying consistent. Thiessen, who is 25, feels he’s come a long way when it comes to not only competing, but also learning how to win. All nine of Saturday’s finalists have proven they have the skills and experience to win. The difference now is which one comes to win (as opposed to merely competing). Thiessen is also taking advantage of having qualified on Wednesday by resting and relaxing on Thursday and Friday, and also using the “bonus” time to hit gym. He did a full workout on Thursday and planned to loosen his legs on a stationary bike Friday. Even though it’s easy to get caught up in the 24-7 lifestyle of Las Vegas, Thiessen said he’ll be turning in early until after Saturday’s final rounds. Then use Saturday night to celebrate what he hopes is a win. Saturday’s final day will feature Zach Flatt, Nathan Harp, Chuck Swisher, Schell Apple, Jestes, Allard, Lippincott, Zarnetski and Thiessen. After five of seven performances, in-arena announcer Matt West is sure the newly founded Bullfighters Only can not only be the next big thing in the world of action sports, but that it will also be a life-changing opportunity for freestyle bullfighters. West, an Oklahoma native, is well versed in western theme sports. His vast experience – in recent years, he’s worked PBR events in the U.S., Canada, Australia and New Zealand as well as pro rodeo events and the annual Road to the Horse – lends credibility to his assessment. The difference, he said, it that freestyle bullfighting will open up western culture to a new world of fans. Freestyle bullfighting is an easy concept to understand. It’s as simple as man versus bull and even casual newcomers immediately realize the bull has the advantage, whereas that’s not always the case in bull riding when some newcomers mistakenly assume bull riders has the advantage because they’re sitting atop the bull. West said, “You have to survive getting around a bull. The top freestyle bullfighters do so with an athletic prowess, grace, style and, more importantly, in the eyes of the judges, they need to maintain control. West also mentioned precision and finesse, which isn’t always easy considering how dangerous the sport is. A fraction of an inch can be the difference between smoothly completing a flat-footed jump or being seriously injured and unable to continue competing. The veteran announcer, who has worked the PBR World Finals for nearly a decade, is excited about what he’s seen in Las Vegas the past two weeks and what the future holds for the BFO. As a fan first and then as an announcer, who also happens to be friends with many of the bullfighters competing, West said he’s especially excited to sit back and watch what happens next year when they have an entire season of BFO events. Freestyle bullfighting hasn’t been in Vegas since 2000, so, in some cases, it’s even new for rodeo fans, who have only followed the sport for less than 10-15 years. However, there have been a growing number of standalone bullfights the past few years, but with the BFO it becomes an easier sport to follow. Much like the bullfighters rely on their instincts, West and the rest of the production staff have also been relying on their instincts and experience to provide the live audience with an entertaining show. After months of social media hype, these have been the first BFO events—ever. West reiterated what others have said since arriving in Las Vegas. There initially was a nervousness and an anxiety that comes from wanting to make a great first impression on what could otherwise be a tough crowd of traditional cowboys in town for the Wrangler National Finals Rodeo. The remaining two performances will take place Friday and Saturday mornings at 9 a.m. in the South Hall of the Las Vegas Convention Center. That said, last week and this week has surpassed expectations. Among the crowds were several bullfighting legends. The likes of which included Rob Smets, Rowdy Berry, Miles Hare and Skipper Voss. West referenced their presence as one of the coolest moments. He said the legends understand the opportunity being afforded todays bullfighters. For that reason, he said it “was a pretty neat feeling” watching them smile and cheer. “I wasn’t around when those 20 (professional bull riders) started the PBR,” West said, “but I’ve been around those guys a lot since then and I’ve heard all the stories—the trials, the tribulations, the positives, the negatives—and I’m around these guys right now and I know that’s kind of the feeling a lot of us on the outside looking in feel. These guys are doing what they love. At the end of the day they’re doing what they love and they’re trying to give themselves the best opportunity to do that. After four of seven performances, the verdict is in. The return of American freestyle bullfighting to Las Vegas has been an overwhelming success with capacity crowds in the South Hall of the Las Vegas Convention Center. In fact, last Thursday afternoon, local Fire Marshalls dealt with a larger than expected crowd for the first Bullfighters Only performance. Online a virtual fan base responded through various social media channels with as much excitement as those who were watching Weston Rutkowski score 90.5 points to win the Roughy Cup. In Las Vegas, the crowds on Thursday, Friday, Saturday and yesterday were made up of curious tradeshow venders and potential sponsors, rodeo athletes and stock contractors, rodeo committee members and executives, traditional rodeo and bullfighting fans as well as casual observers along with past and present bullfighters looking on in support of the BFO. “It was cool,” said BFO CEO Aaron Ferguson, who’s been working with a team of folks to plan the return of freestyle bullfighting in conjunction with the Wrangler National Finals Rodeo for the first time since 2000. Anticipation was at a fever-pitch in the weeks and days leading up to the first performance. A full social media campaign created big expectations for all those involved and the response to numerous BFO videos provided by Hooey TV created an excitement even before anyone arrived in Sin City. Ferguson admitted he felt the pressure of the entire sport of American freestyle bullfighting weighing on the collective shoulders of himself and all 24 of the competitors – which featured the Top 12, as selected by BFO, and 12 other potential qualifiers – who made their to Las Vegas to compete last week and this week. The bulls and the bullfighters performed to a high level. A capacity crowd of onlookers came out as expected. The reality of the moment felt surreal for all involved. While the first four performances were a success, Ferguson was quick to point out they have three more slated for Thursday through Saturday morning at 9 a.m. Ferguson remained focused on the big picture. He wants the BFO to be something people will continue to come back and see every day through Saturday. “I’m looking to see more big tricks out of some guys,” said Ferguson, who is one of three bullfighters selected to work the NFR and is not competing in the freestyle competitions. However, having been a freestyle bullfighter his entire career, the Canadian-native believes the guys will be more familiar with the arena and have a better feel for what to expect in this environment, as well as the big introductions, video cameras and other elements of a PBR-like production. At this point it’s a genuine buzz that goes well-beyond the Internet. That said, Vegas can be a wild town and with the growing buzz of excitement, it would be easy for the 16 remaining freestyle bullfighters to let themselves lose sight of the main objective. However, according to Ferguson and Rutkowski they remain focused and prepared. “We saw some guys get caught on a couple jumps and some tricks,” he added, “but I know they’re chomping at the bit and they’re ready to do this, so big scores and lots of excitement. The difference between winning a freestyle bullfight or winding up being hooked and taken to the ground could be less than half an inch. In a game like that anything can happen. This week, in Las Vegas, the BFO is holding its first major event since being founded earlier this year by Canadian bullfighter Aaron Ferguson. 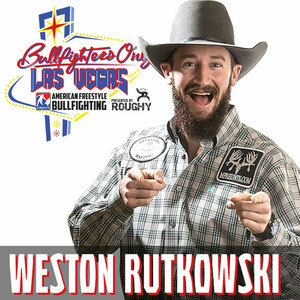 Thursday afternoon, Weston Rutkowski won the Roughy Cup title featuring the Top 12 freestyle bullfighters in the world—not including the three bullfighters selected to work this year’s Wrangler National Finals Rodeo. Friday morning and Saturday morning the BFO hosted a pair of qualifying events featuring six bullfighters each day with a total of four of them advancing to next week’s 16-man Bullfighters Only Las Vegas Championship, which takes play Thursday through Saturday at 9 a.m. in the South Hall of the Las Vegas Convention Center. There’s a total purse of $35,000 on the line and therefore the bullfighters are not only bringing out their best tricks, they are going to be willing to take some major risks in an effort to put themselves in a position to make their biggest freestyle checks of the year. There’s an incentive to be aggressive and risk taking a hooking. Rutkowski already took home $5,000. 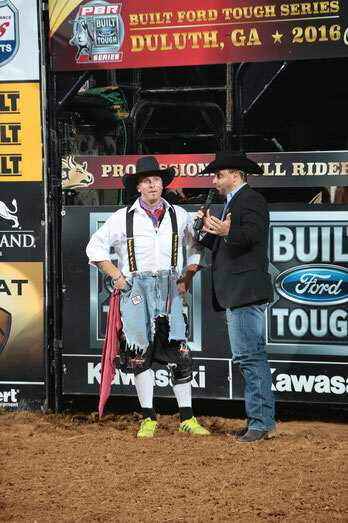 Rumford is a three-time PRCA Clown of the Year and a former Coors Man in the Can. While todays freestyle bullfighters compete at various events throughout the year, this is the first time American freestyle bullfighting has been held in conjunction with the WNFR since the Wrangler Bullfights were held in Las Vegas from 1985 to 2000. For a lot of newer (or casual) western sports fans, this will be their first exposure to this particular action sport. Hare took the time to explain not only how the judging works, but what he’s looking for during each matchup. He explained that scoring a bullfight is similar to scoring bull riding event in that half of the mark is based on the bull and half is based on the performance of the bullfighter. Hare said he initially evaluates the bull. Like a bucking bull, the rankest bulls are marked 22.5 points, 23-23.5 points or maybe on a rare occasion a bull might be scored 24 points. Those bulls are rewarded for being very aggressive, staying hooked, staying with the bullfighter and in turn staying on target. In that particular case, Hare said a 22 point bull might result with a bullfighter earning 23 points for maintaining a fundamentally sound bullfight. For instance, if an animal gets a man down and he loses control or the other bullfighters have to come in and pick the bull off of him, then the bullfighter competing will lose points. It will cost the bullfighter an opportunity to score points (or deduct points depending on how the judge scores) if he’s unable to maintain control of the bull for a majority of the 60 seconds. It all starts with the ground game. According to Hare, the more passes, especially clean passes, the higher a score the bullfighter will earn. A great ground game results in solid fundamental bullfighting. Aggressiveness and difficulty of bull will also help increase the score. Hare is looking for bullfighters to make a lot of clean, crisp passes and step through a few times or fake the bull before worrying about selling their matchup with a trick to finish off the last 20 seconds of a 60-second matchup. He’s also looking to see if a bullfighter can get the bull over to the barrel and do a little barrel work with him prior to the first of two horns sounding. Most everyone arrives in Las Vegas with big expectations. Whether it’s at the blackjack table or the Wrangler National Finals Rodeo for a select few it’s the thrill of victory, while most experience the agony of defeat. 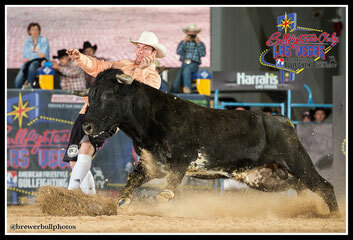 For the first time since 2000, the top freestyle bullfighters in the world are also competing in Sin City. By the time they head home, most will be sharing stories of what could have been. However, regardless of what happens next week, Weston Rutkowski is one of the few who will be able to say he accomplished exactly what he set out to achieve when he arrived earlier this week. Rutkowski won the inaugural Roughy Cup featuring the Top 12 BFO athletes. He was among the favorites coming into the debut BFO event. And then he laid claim to the title with a 90.5-point effort in the Championship Round on Thursday afternoon. Thursday’s win only motivated all that much more to continue doing what he’s been doing, and that’s getting up early and going to the gym. The two-a-day workouts paid off – he claimed $5,000 of the $10,000 added in the 12-man event – and now he’s as focused or more so on next week’s main event. After enjoying himself Thursday and Friday nights, he took it easy Saturday and showed a more disciplined side of himself in refocusing on the task at hand. However, he brushed off any notion that Thursday’s performance makes him the favorite for the 16-man Bullfighters Only Las Vegas Championship, which takes play Thursday through Saturday at 9 a.m. in the South Hall of the Las Vegas Convention Center. Rutkowski was beside himself after drawing Devil’s Candy. The first round bulls were evenly separated into four pens of three and then drawn into specific sections. Then during a BFO meeting on Wednesday night, each of the Top 12 bullfighters drew their respective bulls. Older bulls, like Devil’s Candy, are dangerous because they’ve been fighting and know all the tricks of the trade. They can’t be fooled as easy as a younger, inexperienced fighting bull. Rutkowski made the most of his opportunity. “When I drew him that night I knew, ‘Hey, it’s game on,’” said Rutkowski, who was excited and yet felt a sense of calmness. He took home $5,000, while the rest of the $10,000 added for the Roughy Cup was divided up at $2,500 and $1,500 and $1,000 for second through fourth place respectively. This coming week’s main event has $25,000 added and, according to Rutkowski, the bullfighters haven’t voted yet on how they plan to divide the money up between the final round competitors. In the meantime, Rutkowski and the others will use the next three days to heal up. While he emphatically said “every day is a new day” and despite his growing confidence, doesn’t take anything for granted, he is gaining experience with every bull he fights. Ironically, the biggest lesson he’s learned is to slow down. No, not just outside of the arena, but inside as well. He describes himself as “superfast on (his) feet” and said he’s learning how to slow down enough to let the bull come back to him. It’s a skill he’s developing along with working on reading bulls. Each time he competes he’s learning how to better engage his bull and knowing when to grab a bull’s attention when he’s ready to run off. It’s been nine years since Hollywood Yates last competed in a freestyle bullfight. He’s yet to have forgotten any of the details. That night, in Salinas, California, he rushed to a local hospital, where he underwent emergency surgery and doctors saved his life after being gored by a bull. He then spent two-and-a-half months living with a colostomy bag. “After that they put all my guts back on my insides,” he said. Despite what he went through, he back. Yates will be competing Friday morning in an attempt to qualify for next week’s main BFO event, in Las Vegas, that is being held in conjunction with this year’s Wrangler National Finals Rodeo. Friday and Saturday, at 9 a.m., 12 qualifiers will compete for four remaining spots to join the Top 12 bullfighter as selected by the BFO. So, yeah, he’s back and ready to compete. Yates admitted he’s anxious to get in front of a fighting bull. When Aaron Ferguson first reached out to Yates, the veteran bullfighter asked the CEO if he planned to schedule an entire BFO season in 2016. “Well, I have a spot for you in Vegas if you want it,” Ferguson said. Yates wasn’t been funny or brazen when he said he didn’t need to get ready. In fact, he added he’s always read. From the moment he first talked with Ferguson until Friday morning’s matchup, he was planning to run hills, but pulled calf muscle. He’s typically used to doing more than three hours of cardio in gym every day and, while he wasn’t able to do so, he figured he wouldn’t get out of shape in just two weeks of not doing all his cardio. He still managed to hit the gym regularly. Thursday morning he hopped on a stationary bike and pumped his legs for 20 minutes. Yates said he wanted to see at what point they got fatigued. They didn’t. Yates is the one the freestyle bullfighter, who competed back when the Wrangler Bullfights were held in Las Vegas until 2000. He grew up working as an Elvis impersonator. He was Wolf on the NBC hit television series “American Gladiators.” Guest starred on several network series’ and a reoccurring role on “The Unjust.” He even wrestled as part of the WWE and has worked as a Hollywood stuntman. However, western sports enthusiasts know him best for the 23 years he spent working rodeos. According to his personal Website, Yates worked as a bullfighter and rodeo clown and was a two-time Wrangler Bullfight finalist, a Wrangler Bullfight barrel man, two-time BRO World Champion bullfighter, three-time Salinas Bullfight Champion, three-time Ellensburg Bullfight Champion, four-time FT. Madison Bullfight Champion and over 30 other championships in his career. Nine years later, Yates is well past his prime. However, he said he can still hold his own competing against a draw filled with 20-somethings. Despite the youthful athleticism of the other bullfighters – 16 years older than the next oldest competitor – he’s not worried in the least about his inability to pull off the much-talked-about Superman jump. The one thing about the game that hasn’t changed is that it’s still about mastering the basic fundamentals and putting together a solid ground game. He also said it’s not about speed. It’s about being smart and reading bulls. “I think I have a very good – very good – shot at coming in and winning this whole deal,” Yates said. Thursday night when Aaron Ferguson steps onto the dirt inside the Thomas & Mack Center for this year’s Wrangler National Finals Rodeo, he will have done his job if no one notices. Ferguson is one of three bullfighters selected to work this year’s bull riding event. In bull riding, a bullfighter’s job is to remain invisible and he’s done a great job of it if everyone forgets he’s in the arena. The focus, after all, is on bull riding and cowboy protection is name of the game. That’s not all the case with the Bullfighters Only event Ferguson has organized. 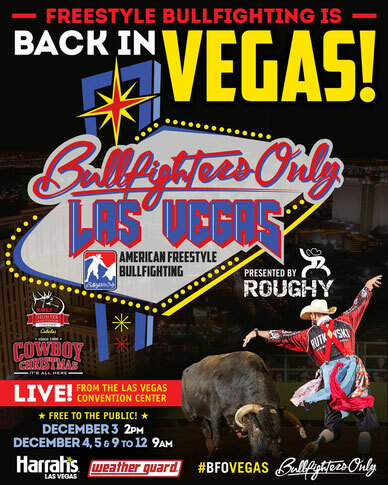 BFO will host its first two freestyle bullfighting events in the South Hall of the Las Vegas Convention Center in conjunction with this year’s WNFR. The first event – known as the Roughy Cup – is scheduled to take place at 2 p.m. on Thursday afternoon and will feature the Top 12 bullfighters as selected by the BFO. They will then host a pair of qualifying performances on Friday and Saturday mornings at 9 a.m. in which four of the 12 qualifiers will then rejoin the Top 12 in a 16-man event that takes place at 9 a.m. next Thursday through Saturday. Unlike a bull riding event, American freestyle bullfighting is about man versus beast. It’s one thing to step in and save a cowboy, it’s another thing all together to step in front of a fighting bull bred for the sport of freestyle bullfighting. Unlike traditional freestyle events, BFO events will be 60 seconds as opposed to 70 seconds, which will only enhance the intensity of watching bullfighters like Weston Rutkowski, Schell Apple and others work their ground game before selling their athletic prowess with a Superman move in which they jump up and over a charging bull in the last 20 seconds of the matchup. Rutkowski has already brought tricks to the sport that haven’t been seen. He’s been training for the past month. He’s there for up to three hours. In the past, Rutkowski said there were a lot of athletes, but they were successful because “you couldn’t beat them up” and it was about outlasting the competition. Today you still have to be tough “to be in this sport,” but today there are guys in the gym seven days a week. Wacey Munsell and Nathan Harp both feel that whatever a freestyle bullfighter lacks in athleticism he can make up with bull savvy (or vice versa). However, Harp agrees that nowadays bullfighters train like athletes. 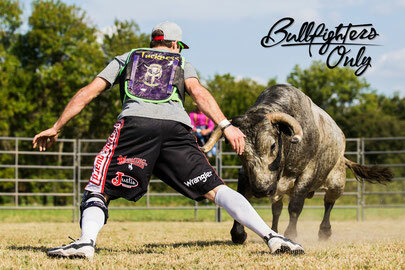 In addition to strength training, Harp works on agility drills and other sport-specific drills – just as a soccer player trains differently in the gym from a football player, bullfighters train differently than other professional athletes – that provides him with the necessary skills to compete in both freestyle and as a protection bullfighter. “That’s where I feel like we’re able to take the sport to a new level,” Harp said, “as far as our athleticism. We train to be athletes and we think of ourselves as athletes. Apple has, perhaps, the most unique training method of all the freestyle bullfighters who are competing this week. He uses slacklining as a means of getting in shape. The Oklahoma State University student will tighten a slackline between two secure poles or trees or another object and then walk the length of the slackline, which is a lot like a tightrope only it has more give to it. In addition to focus and concentration, Apple uses several sets of muscles – everything from calves and thighs to his core strength – to successful complete the feat. At 20, Apple is the youngest bullfighter among the Top 12 competing in Vegas. As such, he’s one of the most athletic. Like Rutkowski, Apple is well-known for attempting and completing a near-perfect Superman jump and is one of the few in Sin City, who isn’t afraid to attempt the intimidating trick if he feels he’s need to in order to advance to the next round of competing. Unlike a prototypical rodeo event, fans will also witness everything from backflips to barrel jumps. Frank Newsom didn’t become one of the most legendary bullfighters by talking about himself or his skills. In fact, he’s one of the most understated professional athletes whose fearless reputation was earned in the arena, while the persona of a God-fearing man was earned by how he’s conducted himself in his everyday life outside of the arena. One might have to actually read between the lines and take a little literary freedom when interpreting how much Newsom was looking forward to next month’s fast-approaching Bullfighters Only event, in Las Vegas, and especially take note of his repeated mention of how excited he was to be part of the first freestyle bullfight held in conjunction with the Wrangler National Finals Rodeo since 2000. “I was kind of excited about it because I don’t want the freestyle deal to die out,” said Newsom, who announced earlier this week he would have to pass on the opportunity because of a knee injury, “and I was excited to hear they were trying to put that together during the NFR in Vegas with some big money added. Newsom is currently on crutches. He’s regularly worked out all year to keep it strong, but as the season progressed it worsened. Newsom said it bothered him “pretty bad” last month during the PBR World Finals. A recent exam indicated a compression fracture in the lower bone under his kneecap, a cyst in the back of his knee, which has since been drained, and a partial tear of the meniscus. It’s a rather typical injury for Newsom. After all, Newsom is still tending to ranch duties as best he can, while trying to keep the weight off his knee. “Well, it could be a lot worse,” said Newsom, who was told he would need four weeks recovery if Freeman decides to scope the injury a second time. Newsom said he had every intention of still competing at the BFO event. However, after consulting with Freeman he thought better of it. Newsom is one of the few remaining bullfighters, who competed the Wrangler bullfights until they ceased hosting them following the 2000 season. It’s a coincidence that Apple was selected to replace Newsom in the Roughy Cup on Thursday, Dec. 3 and will be among the Top 12 advancing to the main event, which takes place the following week in the South Hall at the Las Vegas Convention Center. The Roughy Cup will be held at 2 p.m., while all other qualifier events – Dec. 4 and 5 – as well as the main events begin held Dec. 9-12 will be at 9 a.m.
“I felt pretty honored,” said Apple, who was taken by surprise by the decision to include him among the top bullfighters. “To pick me to step up and take Frank’s place, it was pretty humbling. That said he has a chance to make name for himself on a grand stage like Las Vegas. Newsom likes what he’s seen from Apple. “He actually comes over and works out with us,” said Newsom, who likes being around Apple. “He’s a really great kid. He’s young. He’s got a super good attitude and has a lot of raw talent. He’s fun to watch. Apple started fighting bulls in the eighth grade. He would play football on Friday and compete in a bullfight on Saturday afternoon and the same during track season, where he excelled in hurdles and the high jump. In fact, he holds the Thomas Fay Custer High School high jump record of six-feet, four-inches and incidentally his track coach was not enthused with Apple’s interest in bullfighting. Apple, who is now a sophomore at Oklahoma State University majoring in landscape management, was a natural when it came to jumping. In fact, as a child growing up just north of Weatherford, Oklahoma, his parents had an above ground pool and he would run at it and swan dive over the four-foot wall into the pool. Years later, he would use that same technique earlier this year to complete a near-perfect Superman jump over a bull, while freestyle bullfighting. Whether or not he attempts the same Superman jump in Las Vegas could depend on whether or not Weston Rutkowski tries it first. Footwork and making rounds is where Newsom would have excelled had been in Las Vegas. “It would have been pretty awesome,” said Newsom, of bookending his legendary career protecting cowboys by freestyle bullfighting in Las Vegas. “To me, it would have been a challenge just to see if I could rise to the (occasion) one more time. I feel like I still have one more in me. Evan Allard is a bullfighter and until a year-and-a-half ago he also spent his days as a substation technician for an Oklahoma-based power company. He also raises and hauls fighting bulls. Born and raised in Vinita, Oklahoma, Allard knew he wanted to be a bullfighter long before he ever fought his first bull and despite heading off to Oklahoma State University, where he earned an associate’s degree in electrical engineering, he always had an eye on raising American fighting bulls. As a young boy he was influenced and inspired by legendary rodeo clown Gizmo McCracken. But thoughts of being a barrel man changed, at 15, when he fought bulls for the first time. 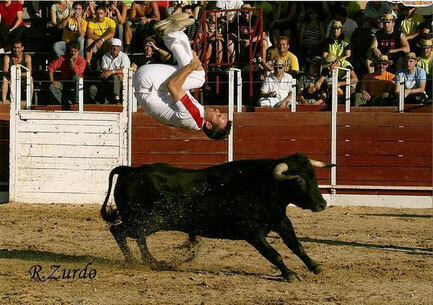 That’s when he started to understand the sport of freestyle and protection bullfighting. Six years later, at 21, he was the World Champion freestyle bullfighter in 2010. When pressed on the issue, Allard finally admitted he was more impressed with himself winning the world title three times – “that I’ve been at the top of my game for that time” – including back-to-back titles in 2014 and 2015. “But being in the elite group of bullfighters is cooler to me,” he added. Speaking of being among the best, Allard started raising fighting bulls in 2009. Next month, Allard is responsible for having 66 of the best fighting bulls in the country out in Las Vegas for the premiere of the BFO being held at the Las Vegas Convention Center in conjunction with this year’s Wrangler National Finals Rodeo. “His whole pen of bulls is just awesome,” said Nate Jestes, who will be among the Top 12 freestyle bullfighters competing, “because he won't haul something he wouldn’t want to fight." Allard currently has 80 acres and roughly 30 head of fighting bulls and four breeding cows. Based on bloodline, size and horns, his herd sire is 208 Devil’s Candy. In addition to the four calves Allard will see he’s also buying 16 more fighting bulls this coming February down along the Mexican border. He’ll then be able to cull some of his lesser quality bulls and have a herd of 40-plus fighting bulls for the 2016 season. However, in less time than the six years it took to grow Allard’s herd from five to 30 he’s looking to eventually double it to between 50 and 60 in order to meet the demand of the ever-growing popularity of American freestyle bullfighting. “I started getting more demand for bulls and they were making me money,” said Allard, who said it’s taken every day of those past six years to build it to where it is right now. Jestes likes the fighting bulls to come out hot and fast – “stick’em with a couple fakes” – and then slow down so he can square up and get a few rounds and keep him engaged. He also prefers smaller bulls, so he can finish off his performance by selling it with a jump. That’s what the top American freestyle bullfighters know to expect from Allard. He’s already easily invested $700,000 into his program – land, gone through dozens and dozens of fighting bulls and heifers, spent $100,000 on his main truck and trailor, bought a second truck – but right now he needs even more land. According to Allard, when he first started there were a fifth of the total number of freestyle bullfights as there are now and that number is likely to balloon over the next few years with the BFO hosting and sanctioning events from coast to coast. Although Allard and Cody Casto, who is based in Louisiana, are not business partners, per se, they will team up to provide the BFO with 66 fighting bulls next month in Las Vegas. In fact, they’ve been working together in helping one another grow their respective programs. In the past, they’ve had as many as three freestyle bullfighting events in one weekend, where they pooled their pens together with Allard at one event, Casto at another and Allard’s father at a third event. “It’s getting crazy,” said Allard, who will haul his bulls to the Pacific Northwest for the first time this coming year. He merely says, “It’s tough,” when it comes to managing his time between fighting bull and being a contractor. However, don’t suggest he might forgo fighting bulls to focus on raising and hauling bulls. In addition to protecting bull riders at PRCA events, Allard also competes in freestyle events and is among the favorites this year at the BFO event in Las Vegas. Legendary bullfighter Miles Hare said he thought Allard was among the favorites to win both BFO events in Vegas. Allard said it’s certainly hard work, but he said it doesn’t feel like a job. There’s a historical relevance when it comes to American freestyle bullfighting in Las Vegas. A precedent was set in 1985 and continued through the 2000 season when the freestyle events were held in conjunction with the Wrangler National Finals Rodeo. Many of today’s freestyle bullfighters weren’t even teens yet when they watched the likes of Miles Hare and later Frank Newsom compete at the year-end event. Nathan Harp, 25, was only 10 years old the last time a freestyle bullfighting event of this magnitude was held in Sin City and he didn’t start fighting bulls until he was 18. But history has a way of eventually repeating itself. With the formation of Bullfighters Only the door has finally been reopened. Next month, after more than a decade-long absence, the BFO will premiere an elite seven-day freestyle bullfighting event at this year’s WNFR. Harp is among 12 bullfighters – Weston Rutkowski, Evan Allard, Nate Jestes, Chuck Swisher, Wacey Munsell, Cody Emerson, Logan Blasdell, Ross Hill, Zach Flatt, Erick Schwindt and Newsom – whose names were confirmed earlier this week. This year’s Vegas event will open with a 12-man invitational in the South Hall of the Las Vegas Convention Center. The Roughy Cup will be held Thursday, Dec. 3 at 2 p.m. Those 12 will then be joined by four other bullfighters, who advance from a separate 12-man qualifier rounds being held Friday, Dec. 4 and Saturday, Dec. 5 at 9 a.m. The main 16-man event with take place at 9 a.m. daily from Wednesday, Dec. 9 to Saturday, Dec. 12 the following week. “This is a great opportunity to put freestyle bullfighting back on the map,” said Harp, who called the December event a game changer for the sport of freestyle bullfighting. Like Harp, Swisher grew up watching freestyle bullfighting as a kid. Swisher, 25, said it’s been a dream of the entire new generation of freestyle bullfighters to have an event in Las Vegas. However, Rutkowski admitted that months ago he was skeptical the BFO would be far enough along to share the stage with an event like the Cowboy Christmas Experience. Rutkowski wasn’t the only one whose excitement today was preceded with trepidation. Jestes said he thought it was a lot of work for founder and CEO Aaron Ferguson to make happen in such a short amount of time, especially since the Canadian native is still an active bullfighter and was recently selected to work this year’s WNFR. Today’s generation of freestyle bullfighters – many of whom, like Ferguson, also work bull riding events at both PRCA rodeos and PBR events – are comparable to the Tony Hawk era of skateboarders. Hawk and others, who emerged in the mid-1990s as mainstream celebrities with the founding of the X Games, followed a real downturn in the popularity of skateboarding. The same can be said for this generation of American freestyle bullfighters, who are hoping the BFO events can do the same for the longtime stability of the sport as well as their individual careers. Twenty years ago those skaters began to push the physical boundaries of skateboarding. The same is happening with freestyle bullfighting today. Legendary bullfighter Miles Hare agreed. The young Oklahoma native said after working as a team at bull riding events, the freestyle competition gives him and his friends a chance to showcase their individual styles. “Finally myself and the other guys get to go head-to-head on a platform like Vegas,” Rutkowski said. Las Vegas in December is synonymous with the Wrangler National Finals Rodeo. However, since 2000, freestyle bullfighting has been noticeably missing from the performances. After more than a decade-long absence, Bullfighters Only will premiere an elite seven-day event at this year’s WNFR Experience. This year, BFO will host a 12-man invitational – as selected by the BFO – in the South Hall of the Convention Center. The Roughy Cup will be held Thursday, Dec. 3 at 2 p.m. Those 12 will be joined by four other bullfighters, who advance from one of the two six-man qualifier rounds being held Friday and Saturday at 9 a.m. The main 16-man event will take place from Wednesday, Dec. 9 to Saturday, Dec. 12 the following week. Evan Allard, Weston Rutkowski, Nate Jestes and Wacey Munsell are among the top named bullfighters, who will be competing in Las Vegas, along with fan-favorite Frank Newsom. All seven BFO performances, which are free to the public, will be held at the 1,000-seat arena in conjunction with the Cowboy Christmas Tradeshow. The second weekend will feature eight bullfighters on each of the first two days in a head-to-head bracket-style format with the eight winners advancing to Saturday. Friday’s performance will feature the eight bullfighters who didn’t advance, in a “wild card” round, with one of them earning a second chance opportunity to compete on Saturday. The nine-man long round on the final day will be followed by a three-man short round to determine the 2015 champion. Among the two rule changes that break from tradition and were instituted as a means of impacting the intensity of the event, are the “flankless bull” rule and the fact that each bullfight will last 60 seconds as opposed to 70. The BFO will promote having the top fighting bulls and the best athletes—some of whom did not grow up on a ranch, but revered as having been athletically gifted while competing in their previous sports. Ferguson and others involved in launching the BFO said fans can expect to see a lot more hand-on-head action between the bullfighters and bulls in creating the return of one of the most highly anticipated action sports in western culture. “It makes me want to be young again,” Hare said. “It makes me want to put the cleats on and go out there and play." The event will be available for fans to view from home. Live stream and television coverage information to be announced at a later date. Founded in 2015, Bullfighters Only is a platform created to revolutionize the sport of American Bullfighting. Originally launched as an online store for all things bullfighting, BFO’s rapid growth has allowed the organization to expand quickly into other avenues. Bullfighters Only aims to develop the sport from the ground up through affordable clinics and equipment, cutting edge content, engaging social media, aggressive athlete marketing, and most importantly, high energy live events. Carrying serious momentum into 2016, Bullfighters Only will sanction several existing freestyle bullfighting events while adding dozens of new stops to the Tour schedule. By following successful blueprints of other action sports, Bullfighters Only will crown the first true World Champion Freestyle Bullfighter in over 15 years and propel the sport into the main-stream.